By far the most fun had by four GREENinckers during office hours in the last month was taking part in the City of Johannesburg Public Transport Challenge on the 17th of October. We met at Park Station at 7am. The Challenge used “Amazing Race” rules, and each team received an envelope with clues to 3 places around Joburg they had to visit using public transport only, or else walk. The organisers had intended to ban the use of minibus taxis (not really public). On the day though, as if planned to give us habitually “car-captive” participants a real taste of the public transport commuting experience, the Rea Vaya (rapid bus system) drivers were on strike, so we were allowed to use taxis after all. Our host, the MMC for Transport, took the competitive edge off our team somewhat by saying that it wasn’t really a race, more an adventure, and announcing that she would only arrive at the Soweto Theatre, our end destination, at 12pm. 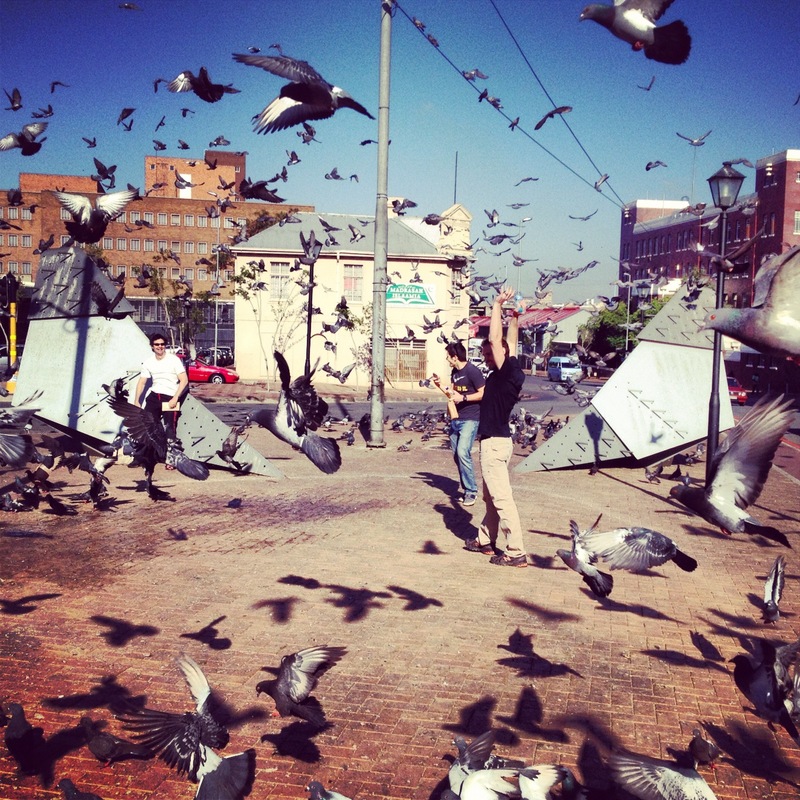 We walked the couple of blocks to Joubert Park, our first stop (“A park in the CBD where there is a greenhouse”), then walked back and took a Gautrain bus on a route that would take us as far west as we could get to visit the origami pigeon sculpture in Newtown (“real and origami pigeons”). Then we decided we’d better go for breakfast, otherwise we’d end up sitting at the theatre for hours, so we walked accross to Braamfontein and had a leisurely breakfast at Narina Trogon. We then asked our waiter how we should get to Baragwanath Hospital (“largest hospital in Southern Africa”). He told us no problem, just walk one block north, catch a metro bus to Ghandi Square and then another one to Baragwanath. Which we did, but when we got there our bus driver told us there was no bus to Baragwanath, and that we should have told him where we wanted to go when we got on, not at this late juncture. So he got off the bus too, and found us a bus that would take us to the Bree Street taxi rank. Almost everyone we met, with the exception of one taxi driver – more about him later – was extremely helpful, even if the directions they were giving us were totally wrong. Commuting humour, perhaps? Anyway, we got to Bree Street and were met by more friendly, helpful people who guided us to the right taxi. By the way, Flo says all this friendliness was definitely not normal, but neither was the site of four white guys in the rank, I suppose. We discovered that it’s much nicer being inside one of these babies than sharing the road with it in a car. We had a comfortable ride to Baragwanath, and were dropped of right outside. Then we walked accross the road to the Bara transport hub, and after being sent from one end of the building to the other a few times (ha ha!) found another taxi to take us to Jabulani Mall. This time the driver wasn’t shaken out of his normal disposition by the four of us. After we’d dropped everyone elso off, we were driving in the opposite direction of the mall, and he grudgingly turned around to take us there, muttering “tourists!” under his breath. I’m sorry to say our team wasn’t one of the first to arrive at the end point, but we still got to enjoy the ride back on an open-topped bus. As always, there are some cool posts on the facebook page. There are some pocket parks in LA funded by public-private partnerships. And you’ve got to love this “stacking green” house in Saigon, even if from the the outside it looks a bit like one of those stacks of veg crates that nearly runs you over in the supermarket isle. Elize posted these quirky illustrations. Ever wanted a caravan to tow behind your bicycle? No? Well, check these out anyway, they’re really funny, thanks Annamari. There are all kinds of sprouting products. And James posted this styling camping-themed hotel for those who aren’t entirely sure that they want to get out there. We are working on some exciting projects all over as usual, Anton went to Uganda this week for a new project and we are also working on an amusement park in Nigeria and a mixed-use project in Kenya. Good news is that the Innovation Hub project in Botswana is also set to start up again. We’ll keep you posted on these and more. The 49th IFLA World Congress is done and dusted, and most of GREENinc has made its way back to the office from Cape Town. What a huge event, look out for the special supplement in the Mail and Guardian on Friday, and well done to the organizing committee. It was great to see old friends and colleagues from around the country and the world and be inspired by the likes of landscape architecture legend Kathryn Gustafson, whom we couldn’t resist quoting on facebook. And Cape Town managed to stage some spectacular weather for the duration. You’d think it was always sunny and balmy there at this time of year. I took the slow way down, via Namaqualand, and so missed all of what I believe was some seriously dramatic weather here in Joburg. And we had snow within the same month too, which you will see from the photo had us as excited as schoolkids soon after my last newsletter. Well, it’s not every day you see that in Jozi. Lots of other cool stuff on the page this month (sorry), like a rooftop aquaponics farm in Orlando and long-time GREENinc collaborator Marco Cianfanelli’s website. Not so cool is the state of many of our public playgrounds. This tent looks like it will make a statement next time you pull into a campsite. It reminds me of a spoof video I once saw on the last of the great campers. All it needs is some potted plants. There are also some of Anton’s hand sketches for a project we’re working on in Kenya and an article on parks as infrastructure. Finally, check out the posting of Freedom Park on Landezine. Early last month, our Sharpeville Memorial project was published in Landscape World magazine, and that set us to posting the covers of the books that our work has featured in. Most recently, in a book entitled “Constructing Shadows” compiled by Petschek and Gass and in “South African Landscape Architecture”, compiled by Stoffberg, Hindes and Muller, which is actually a pair of books, a reader and a compendium. This last publication has been released just in time for the IFLA World Congress which will be held in Cape Town in just over a month. Wait, let me post the link too, haven’t I done this before? 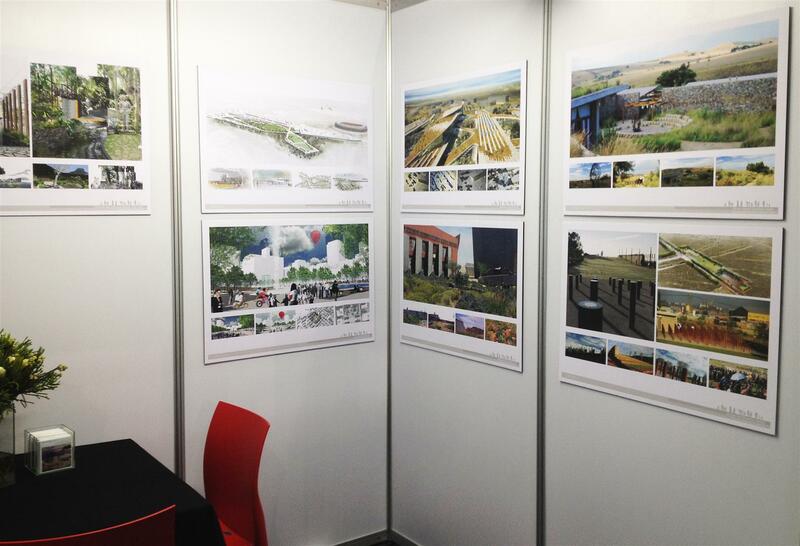 IFLA is the International Federation of Landscape Architects and it’s a great honour for us to be hosting this event here in SA. Of course the whole office will decamp to Cape Town that week. Have a look at the programme, there are some great international speakers that won’t just appeal to landscape architects, with urban, cultural and ecological themes. Speaking of pictures, I was oggling these images of exotic retreats and I said I would share them because PG was drooling over my shoulder. They are billed as being for designers – of course it was a design-related site, I was trying to do something at least a bit work-related before I got side-tracked – don’t you hate that? It’s like when you go to outlook to get a phone number so you can phone someone, but it opens in your inbox instead of your contacts, and then your eye is caught by a particular e-mail and then you forget to make the call? There’s definitely a design flaw there. Now what was I writing about? Oh, ja, these places are supposed to be for design buffs, but I don’t think anyone would mind too much having to go there. And finally, we shared the Sunday Times’ picture of our friend Gerald Garner and an article about his inner-city walking tours. We’ve had guys digging up paving in front of our office and drilling holes in its walls in the last few weeks, all gearing up to installing a fibre-optic line. It’s very exciting. We should even be able to download YouTube clips once they eventually finish. 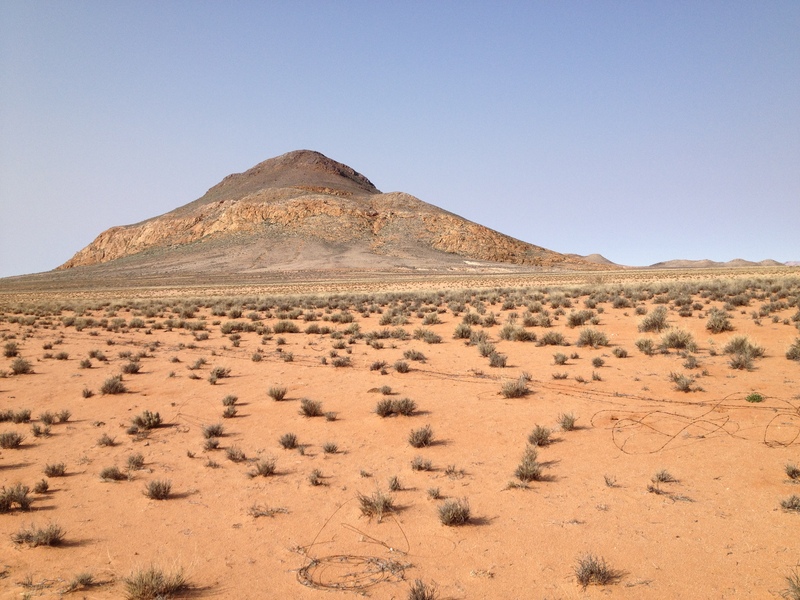 Until now, we’ve (not) enjoyed what feels like the slowest internet connection in the country – if not the world – because, we’re told, we’re on the Rosebank telephone exchange and it’s hopelessly overloaded. Of course now that we’ve made this commitment to more expensive technology we hear that Telkom has at last decided to upgrade our exchange next month. Oh well, we’ll still be faster and Telkom will feel the loss of our business, I’m sure! 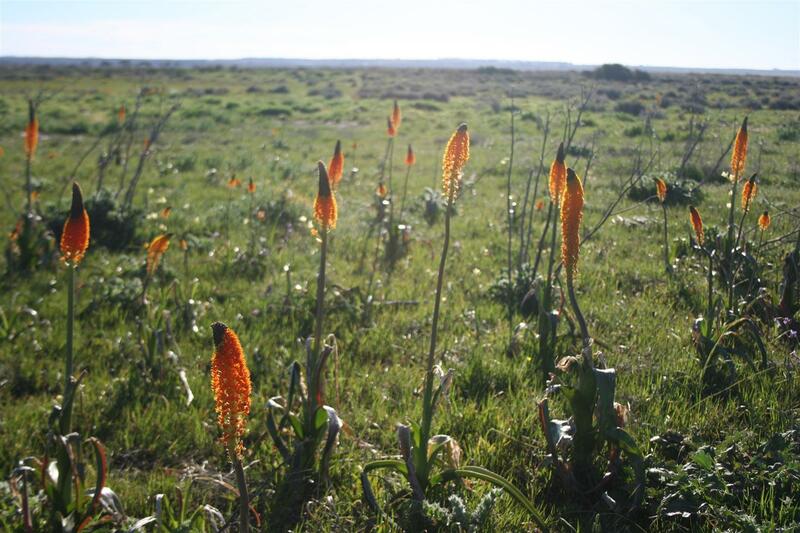 Luckily we’ve stayed in the office a bit more in the last few weeks, but our work has been getting out there. The Alive Exhibition that featured some of it went off well by all accounts. Have a look at the photo gallery from the exhibition. Annamari posted a link featuring temporary structures for the Olympics, and James posted some shelving and people who put themselves on the shelves. It doesn’t look like it was very comfortable. In fact, it probably felt pretty much like those shelves that pass for benches at the Gautrain stations. 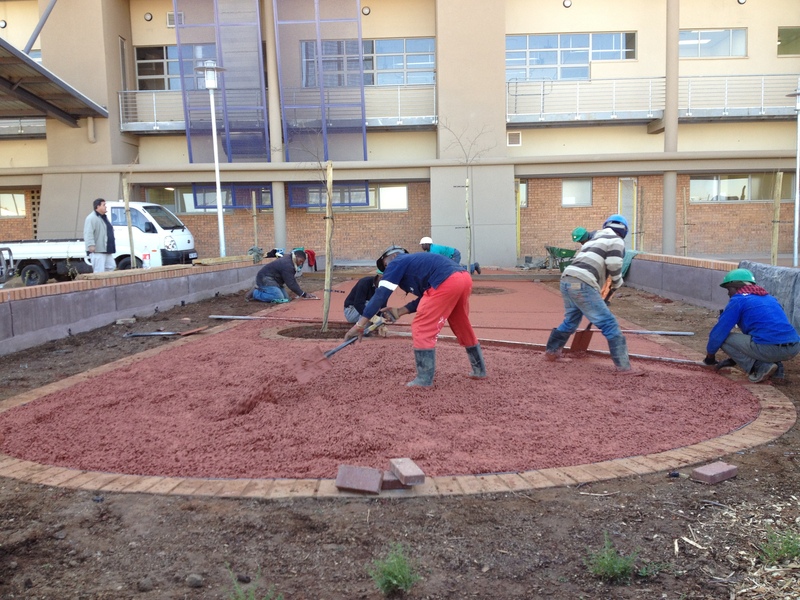 Casting tinted concrete at Jabulani Hospital. Don’t worry, it will dry to the same colour as the sample!